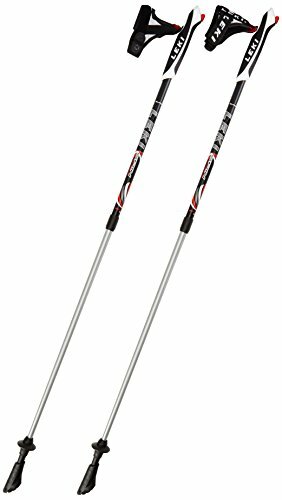 Leki Nordic walking sticks, the first price Leki. Spin is recommended for those who want to start with the NW, lightweight aluminum, rubber tips Powergrip Pad and the excellent Super Lock System. Adjustable from 100 to 130 cm. System adjustment and closing Super Lock 360 . Tube alloy d 'aluminum HTS 5.5. Handle Glide Zone Trigger 1 - V2 with drawstring Trigger 1 SML. Tip carbide wheel Nordic Walking and rubber Powergrip Pad. System adjustment and closing Super Lock 360 °.